In the broadcasting industry, over-the-air (OTA) is a type of wireless transmission platform. It is mainly used in radio and television platforms for broadcasting the channels wirelessly. With the evolution of technology, the broadcasting industry is also changing its channel platform by implementing transmission platforms. The primary technology used in the over-the-air transmission platform is ATSC 3.0, a next-gen transmission. This platform is projected to change the delivery platform of video, audio, and many other services in the near future. The deployment of ATSC 3.0, is expected to impact the transmission platform. ATSC 3.0, an advanced television systems committee standard is the key to enhance antenna televisions and allows sound upgrades and 4K resolution. The OTA transmission platform is expected to allow broadcasters to send 4k HD video. Additionally, increased research and development spending in the broadcasting industry is anticipated to drive the OTA transmission platform market. In the broadcasting industry, growth in IT investments in the broadcasting industry is expected to provide productive opportunities for OTA transmission platform providers across the world. The global OTA transmission platform market has been segmented based on solution and geography. The market based on solution is segmented into platform and services, where services are further segmented into consulting, installation, and support/maintenance. The platform segment is expected to see strong growth in the coming years, primarily due to strong penetration of consumer devices such as televisions, TV tuners, and set-top-boxes across the world. Over-the-air homes would be able to access cable and subscription video on demand content through digital devices such as smart TVs in the near future. High growth in the future is expected due to rise in OTA platforms integrated with ATSC 3.0. ATSC 3.0 is projected to offer broadcasters with the opportunity to provide over-the-air TV to fulfill the rising consumer demand for advanced television experiences. The TV broadcast industry is on the edge of completing ATSC 3.0. It is anticipated that the Federal Communications Commission (FCC) would give broadcasters the capabilities to transfer ATSC 3.0 signals through over-the-air spectrum. U.S. cable operators are contemplating the effects of next-gen broadcast TV standards on their infrastructure. The Canadian Radio-Television and Telecommunications Commission considers OTA transmission of television signals to play a significant role in the Canadian broadcasting system. Furthermore, OTA transmission offers a broadly accessible and affordable choice for the people of Canada to access local and other television programming. 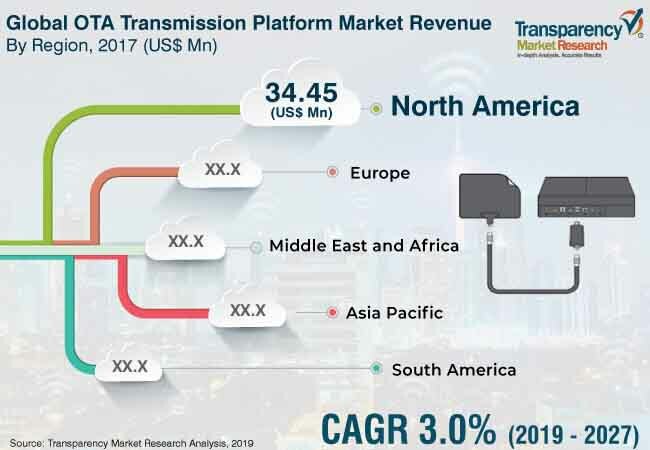 In terms of region, North America and Asia Pacific led the OTA transmission platform market in the year 2017 and is expected to remain dominant throughout the forecast period from 2019 to 2027. In North America, digital antennas for digital terrestrial TV are experiencing a resurgence as customers consider over-the-air TV as an alternative to pay TV. North America has prominent market share due to the growing awareness of the OTA transmission platform. North America is expected to retain its dominant position throughout the forecast period. Asia Pacific held considerable market share in the year 2018. This is primarily due to the South Korean government and its manufacturers. Last year, LG Electronics announced the world’s first ATSC 3.0 4K TV for the Korea market with Samsung following later. Pyeongchang 2018 Winter Olympics showcased the country’s events, as numerous events were broadcast over the air in 4K. In the Middle East and South America, the OTA transmission platform market is expected to expand in the coming years. Key players profiled in the global OTA transmission platform market include Harmonic, Inc., LG Electronics Inc., SK Telecom Co, Ltd., TiVo Corporation, Channel Master, AirTV L.L.C, GatesAir Inc., Tablo TV, and Sinclair Broadcast Group, Inc. This report by Transparency Market Research on the global OTA transmission platform market analyzes and forecasts the data at the global and regional levels. The report provides an analysis of industry trends in each of the segments from 2016 to 2027, where 2019 to 2027 is the forecast period and 2017 is the base year. The global OTA transmission platform market report provides in-depth and accurate analysis of the market. It also highlights various drivers, restraints, and opportunities expected to influence market growth during the forecast period. The study provides a complete perspective about the OTA transmission platform market and expansion throughout the research study in terms of value (US$ Mn) across North America, Asia Pacific, South America, Middle East & Africa, and Europe. Moreover, the study explains the penetration of each market segment within various regions and how these segments have accelerated the growth of the market. The OTA transmission platform market report covers all the major trends and technologies playing a major role in market growth from 2018 to 2026. The overview section of the report analyzes market dynamics such as drivers, restraints, and opportunities that influence the current nature and future status of this market, key indicators, integration challenges, adoption analysis, and trends of the market. A market opportunity analysis for every segment has been included in the report to provide a thorough understanding of the overall scenario in the OTA transmission platform market. The report also provides an overview of various strategies adopted by key players in the market. The report segments the global OTA transmission platform market on the basis of solution. Solution is segmented as platform and services, where services is further segmented as consulting, installation, support/maintenance. In the solution segment, platform accounted for highest market share in the year 2018. The report also highlights the competitive landscape of the OTA transmission platform market, thereby positioning all the major players according to their geographic presence and recent key developments. The comprehensive OTA transmission platform market estimates are the result of our in-depth secondary research, primary interviews, and in-house expert panel reviews. These market estimates have been analyzed by taking into account the impact of different political, social, economic, technological, and legal factors along with the current market dynamics affecting the OTA transmission platform market growth. This report provides all the essential information required to understand the key developments in the global OTA transmission platform market and expansion trends of each segment and region. It also includes strategies, company overview, and key competitors under the company profiles section. Additionally, the report provides insights related to trends and their impact on the regional market. Moreover, Porter’s Five Forces analysis provides analysis of bargaining power of buyers, bargaining power of suppliers, threat of new entrants, threat of substitutes, and degree of competition in the global OTA transmission platform market. The study provides a comprehensive ecosystem analysis of the global OTA transmission platform market, explaining the various participants including software & third-party vendors, system integrators, and distribution channels of the value chain operating in the market. Primary research involves telephonic interviews, e-mail interactions, and face-to-face interviews for detailed and unbiased reviews on the global OTA transmission platform market, across regions. Primary interviews are conducted on an ongoing basis with industry experts and participants in order to get the latest market insights and validate the existing data and analysis. Moreover, the data collected and analyzed from secondary and primary research is again discussed and examined by our expert panel.